Already more wittily articulated here by , but I had to say something about this sooner or later as well. This also goes for Microraptor and Anchiornis and Sinornithosaurus and Caudipteryx and Similicaudipteryx and probably every aviremigian anyone ever intends to draw except for ones that don't have forearms like derived hesperornithines or dinornithids. I love th way you defend birds as living dinosaurs and how you educate many people with missleading things in mind. I'm looking for a picture of a "tutorial" on how to properly draw a dromaeosaurid you share it on the FB Paleontology page but I cannot find it, can you help me? Thanks a lot! It's been a long time since I've shared anything on the FB Paleontology page and there are quite a number of dromaeosaurid tutorials out there. Might it have been this one? Thanks for the answer... Its similar but in the one I'm looking for there is details of feather insertion both in hands and legs. Here's one that covers that, but only that. I can't remember any others that detail leg feathering from the top of my head. No, _that_ is what the wings look like, really. That's how almost everyone draws them. When one looks at the actual fossils, however, that's clearly not how the wing feathers attach. Which only makes sense, as that's the way they attach in all birds and other maniraptors for which wing feathers are well preserved. And some more recent ones too. Ick. I used to this but then I learned better. Now I can't stand primary less avirimigerian reconstructions! I used to do it as well. Yikes! I'm amazed at how the "first bird" gets the half-arse treatment. Indeed. Probably because it's supposed to be "half bird half reptile". Bleh. Even though birds are reptiles. Yep, it's the ingrained Linnean mindset. P.S. I'm a vegetarian, but I couldn't pass up that play on words. Haha. Yeah, as I'm sure you know, I find it aggravating enough when people make this mistake for any deinonychosaur - or anything as derived or moreso than oviraptorids for that matter - but with Archaeoperyx, it just makes utterly no sense. The primaries, and their site of attachment, could not possibly be any clearer than if you killed an extant bird, spread its wings out, and pressed it into the mud. The Berlin specimen at least is one of the most beautiful and obvious fossils showing this in existence, and it's just so sad when people ignore it, or don't even think to look at the fossil. It's definitely a mistake that novice paleoartists make because they're inclined to learn how to draw from copying other artists' work, rather than by looking at the fossil itself, reading the diagnostics, and looking at skeletals. So one bad (but perhaps technically good) illustration can perpetuate a retarded inaccuracy for years just by basis of the meme effect. I started out drawing crappy Archaeopteryxes too. So sometimes it's worthwhile being patient with people, because some of them certainly grow out of it once they learn more. But others are just worth making fun of. Most certainly; my earliest Archaeopteryx (and deinonychosaurs) were really crappy too. 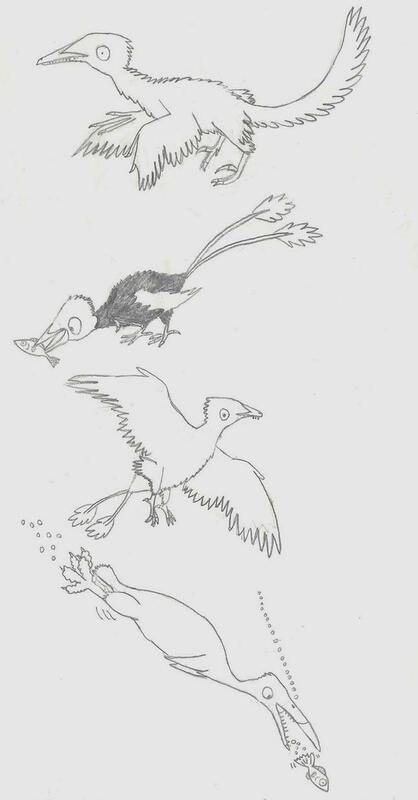 For comparison here's one of the earliest drawings I posted online of some Mesozoic birds (including an Archaeopteryx) and an updated rendition of the same. (There are still things I'd change now in the updated version, but far less than before.) There's also this, which was so crappy I took it out of my gallery altogether, and this old drawing with primary-less oviraptorids and troodonts, which I can't update even if I still had it with me because it's been colored in. Heh, interesting. I think I was watching you back then but for some reason, knowing you now, it's really hard to imagine you drawing inaccurate paravians lol. Here's one of my oldest Archies (hands go where?! ), and Skrepnick ripoff. Come to think of it, I think the first one I drew where I got the hands basically right [link] was the first one you commented on. hahaha I knew the right time to come in! Hey, give me a break, I was 17. 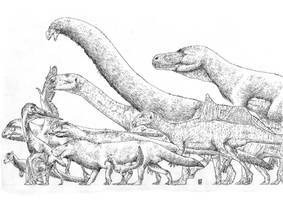 I had only been drawing "paleoart" (as opposed to "dinosaur art") for a few months. I learned fast though.